When did you last tell someone about a dream you had? Do you have a friend who regularly shares their step count, as measured by their latest fitness tracker? Sharing both types of intimate information with others allows us to tell specific stories about ourselves: to construct a self-image. On the surface, dreams and activity tracking seem to have little in common. We see dream reports as subjective and memory-dependent, whereas activity data is objective and measured using technology. However, as a psychologist interested in wearable technology and activity tracking, and a philosopher interested in dreams, we noticed a striking parallel in our work. We like to be seen as hardworking and healthy, which can be conveyed by sharing our activity data. We also want to be seen as interesting, creative or funny, which motivates dream reporting. Through sharing this information with each other we attempt to subtly display our positive characteristics, even if it can mean making things up. An abundance of smartphone apps, wearable sensors and other devices now allow us to quantify our ordinary activities. These devices track our lives and bodies, awake or asleep. The accompanying software allows us to share our data online with friends and the general public. Just a few years ago, it would have been hard to imagine that we would choose to measure our every movement and generate a digital record of our steps, running efforts, and other personal information. These devices are quite remarkable: small enough to wear comfortably at all times, while picking up minute movements and even blood volume changes. They can discern with reasonable accuracy if we are sleeping, awake or even out kayaking. Dream logging and sharing can also be assisted by technology (Ko et al., 2015). One prominent example is the app Dreamon, designed by the psychologist Richard Wiseman to influence the types of dreams you have and to share their content. Of course, lab-based technologies such as electroencephalogram (EEG) have been used to track sleep since 1951. More recently, functional magnetic resonance imaging and machine-learning techniques have even reconstructed simple dream narratives directly from brain activity (Horikawa et al., 2013). Currently, this can only be achieved under very specific conditions using expensive machinery and an extensive library of an individual’s dream reports. But one day we may be able to use such techniques to record our forgotten dreams and then, inevitably, to share them with others. For now, we just report what we remember informally with friends and family. Consider your last vivid dream. Did you share it with someone? Why? Sharing different types of personal information is important for constructing our self-image. Lifespan research suggests that how we view ourselves and our self-esteem impacts our most important life experiences, from mental health outcomes to job satisfaction (Orth et al., 2012). Classical psychological theories present self-esteem as an internal measure of actual and imagined assessments from others that you are close to (called the ‘sociometer hypothesis’ by Mark Leary and colleagues). Our self-esteem can change when we hear what other people think about us (Will et al., 2017). Group participation, interpersonal and intergroup comparisons and a sense of belonging all contribute to this. The need to believe in your self-worth or importance is a strong motivator of behaviour, and impacts how people view themselves, others and life events (e.g. Leary & Baumeister, 2000; Ross, 2002). We strive to improve our social standing and feel good about ourselves by putting forward a positive self-image. You want people to know the ‘real you’, but you also want to be liked and admired. In the self-tracking world, the mantra is ‘You Can’t Improve What You Can’t Measure’. You quantify selected aspects of your life – sleep, step counts and heart rate – in order to improve them. New tools allow you to share your data with others, adding another motivation for self-tracking. What was once a means to ‘know thyself’ through numbers and metrics has shifted towards ‘telling others about thyself’. Every major activity-tracking device company, such as Fitbit, Garmin and Jawbone, has a ‘social network’ feature. Strava, established in 2009 and known as ‘the social network for athletes’, is perhaps the best-known example of an activity-sharing platform. In the one location it ranks a variety of activities such as running, biking and swimming, allowing you to compare your performance with others. Using specialised platforms like Strava helps you to avoid irritating your ‘uninitiated’ non-tracking, (non-improving) friends on Facebook. By 2016, 350 million sporting activities were uploaded to Strava and 30 per cent of users are active daily. Sharing activities typically elicits support via ‘kudos’, a mechanism similar to Facebook’s ‘likes’. Arguably, the main reason for its popularity is this emphasis on social competition (West, 2015). You can also show off the ‘highlight reel’ of your best performances. There is a wide array of metrics and scoring systems, such as Strava ‘suffer scores’ which track your efforts on a given activity. Why share this data? Posting online may act as a personal motivator, but there is certainly a strong element of image-construction as well. People often keep some activities ‘private’ and away from view, while highlighting other activities with amusing captions or notes. Sharing allows you to tell a story about yourself, such as ‘I’ve just started running. I’m not the fastest, but I’m really getting out there’, or ‘I am chewing up these cycle routes because I am a serious weekend warrior’. Your story is backed up by numbers, and we all know that data and numbers are compelling: it’s ‘objective’. One study on Facebook and Twitter use suggested that ‘letting others know what you’re up to’, was the most important motivator of sharing behaviour (Stragier et al., 2015). In fact, when the authors directly compared motivations for sharing, showing your peers that you are actively engaged in healthy activities emerged as even more important than receiving support from others. Another interview-based study reported similar motivations among Strava users, with one cyclist stating ‘there’s an element of vanity to it, look at me, look how fit I am’ (Smith & Treem, 2017). A second interviewee who was initially reluctant began sharing because ‘I was like now I’m ready to show off my skills [laughs]’. Part of our willingness to share our stories stems from the picture they portray of us. Similar motivations are at play when you choose to report your dream experiences. There is a socialising aspect to dream reporting, just as there is for activity sharing. Friends enjoy telling dream stories, and families are often looking for a topic of discussion around the breakfast table. Dreamt something nice about your close friend? Telling them might make them feel special. But dream reports, just like race times, don’t go unfiltered. We are selective about who we report to and what we choose to share. Reporting dreams is a common practice, yet unlike activity data, there is little agreement about what dreams mean, or if they mean anything at all. A mish-mash of recollections, thoughts and randomness bind together as a vivid hallucination (Revonsuo & Tarkko, 2002). Our dream-self may even have a different personality, abilities and memories from our waking-self (Rosen & Sutton, 2013), yet many believe that dreams can tell us hidden truths about ourselves (Colace & Boag, 2015), and the self-help aisles of bookstores are filled with books on what dreams may symbolise. Even if we think that dreams are meaningless cognitive garbage, we often hesitate to report the embarrassing ones. Those who think that dreams are profound, symbolic or indicative of personality traits have even more motivation to report them, or to be selective in which ones they share. 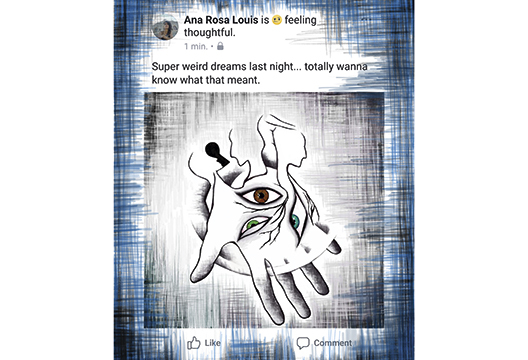 And although we all have a mixture of boring and exciting dreams, many believe that having complex, interesting dream narratives reflects a complex, interesting personality – by sharing these we can show such valued personality traits indirectly without appearing to outright boast. This is akin to the indirect demonstrations of positive traits that sharing activity data affords. Since typical dream memory is so bad, as J. Allan Hobson and others have pointed out, reporting a dream often requires more than simply recollecting it: we have to construct a story. Others cannot ‘validate’ dreams in the way we can validate physical activity data. Image construction in both senses is important to our social standing, and like anything that can benefit us, there is always temptation to filter and to fabricate. A message pings from ‘Your friends at Strava’: ‘Hey Christine, You just lost your Queen of the Mountain on Mt Rael Climb to Melanie by 2 seconds. Better get out there and show them who’s boss!’ How do you respond? Strava is commonly criticised for encouraging bad behaviour such as overtraining, dangerous cycling and, most loathsome of all, cheating. There are many ways to cheat, even including websites specifically developed for this purpose such as the (now defunct) Digital Epo website and GPXspeed Up. You can ‘miss’ the hills, press pause and not record during the slow parts, deliberately use tailwinds… you could even try holding on to a vehicle, although this is not advised! It’s a well-recognised problem, and there’s a system to catch both accidental and non-accidental cheating. Other users flag suspicious activity, temporarily removing it from community view until it is reviewed by the original poster. If much of this tech has emerged from the ‘self-improvement’ movement, why cheat? Motivation for professional cheating amongst elite athletes is obvious, despite the harsh punishments if caught. In contrast, there is little material reward for the amateur athlete… beyond image construction. Indeed, it has been argued that desire for recognition within local sporting communities has been a driver towards doping even in amateur cyclists (Henning & Dimeo, 2015). The risk of being found out is lower and punishments are less harsh than for professionals: an amateur cyclist’s career is not on the line. Still, they do risk public shaming and exclusion from valued social circles. At the other end of the spectrum, dreams are easier to invent and harder to disprove, but carry less social benefit. However, we have found that many people will admit to fibbing about their dreams when questioned. These informal interviews also revealed that we often suspect another’s reports of being exaggerated or made up – even their own children’s dreams. Why do this? We’re back to creating a positive self-image by ‘showing’ rather than ‘telling’. Those who think dreams indicate creativity might think that if you want people to know that you are good at painting, paint something good; in the same way, reporting a creative dream shows I am a creative person. There’s also an interpersonal relationships angle. A 2014 study by Dylan Selterman’s lab found that dreams of infidelity correlated with lower feelings of intimacy over the following days. While irrational, it may be that the emotional content of the dreams has a ‘priming’ impact on subsequent behaviour. And even though saucy dreams are most likely a random concoction of emotion, context, sensation and characters, rather than Freud’s idea of ‘wish fulfilment’, perhaps we just err on the side of caution instead of sharing them! Creating an image of oneself to present to others is a common reason for sharing personal information. Many believe that our data says something important about ourselves: who we are as a person, and our abilities. Despite their apparent differences, in both dreams and activity reporting we choose and construct what we share. We do so for a multitude of related reasons: to ‘fit in’ to a social group, to entertain through storytelling, and to present an image of ourselves. Yet there are differences in the types of stories we want to tell using activity data or dream reports. We may share activity data to construct an image of a hard-working self-improver, whereas we share dreams to emphasise creativity or intelligence. We all construct our self-image in different ways. With technology becoming relevant to every aspect of our lives, self-tracking activity and data sharing – along with its illusion of objectivity – are on the rise. Perhaps our reasons for sharing, and how we do it, will continue to tell us as much about who we are as the stories themselves. Unintentionally, both parents seem to motivate their children to make up dreams or add details when none come to mind. In comparison, children’s reports collected in the lab by researchers are relatively simple, with little or no complex narrative structure. These include far fewer bizarre and creative elements than home-reported dreams (Foulkes, 1999). Are we over-sharing? For some, reading a friend’s continuous updates about their workouts and listening to long dream tales are incredibly tedious. Audiences may react negatively to shared dreams or activity data: the annoyance of seeing posts perceived as ‘boring’ or attention-seeking can lead to ignoring or outright unfollowing (Epstein et al., 2015). Yet there is also evidence that exercise-related Facebook status updates receive a high number of likes (Marshall et al., 2015) and that running activities posted on social media have a contagion effect (Aral & Nicolaides, 2017). Listening to your child’s dream report or discovering that your best friend just completed her first marathon may be genuinely interesting. Also, remember that posting to a dedicated exercise site may be quite different from sharing on a broad platform, such as Facebook. Similarly, telling a close friend about your wacky dream is different from telling an elaborate dream story to your work colleagues. Even if you find dream stories boring, you may be intrigued if someone has a dream about you. Do you know someone who can’t stand it when you report dreams? Tell them you had a dream about them last night and see if they push for details. Context and chosen audience can make all the difference as to whether a report piques somebody’s interest. And, as we have argued, getting a positive response is a motivator for reporting both types of information. Aserinsky, E. (1996). Memories of famous neuropsychologists.Journal of the History of the Neurosciences, 5(3), 213–227. Colace, C. & Boag, S. (2015). Persisting myths surrounding Sigmund Freud's dream theory: A reply to Hobson’s critique of the scientific status of psychoanalysis. Contemporary Psychoanalysis 51(1), 107–125. Epstein, D.A., Jacobson, B.H., Bales, E. et al. (2015). From ‘nobody cares’ to ‘way to go!’: A design framework for social sharing in personal informatics. Paper presented at the ACM International Conference on Computer-Supported Cooperative Work and Social Computing. Foulkes, D. (1999). Children’s dreaming and the development of consciousness. Cambridge, MA: Harvard University Press. Henning, A.D. & Dimeo, P. (2015). Questions of fairness and anti-doping in US cycling: The contrasting experiences of professionals and amateurs. Drugs: Education, prevention and policy, 22(5), 400–409. Hobson, J.A. (2002). Dreaming: An introduction to the science of sleep. Oxford: Oxford University Press. Hobson, J.A. (2005). In bed with Mark Solms? What a nightmare! A reply to Domhoff (2005). Dreaming, 15(1), 21–29. Horikawa, T., Tamaki, M., Miyawaki, Y. & Kamitani, Y. (2013). Neural decoding of visual imagery during sleep. Science, 340(6132), 639–642. Ko, P-R.T., Kientz, J.A., Choe, E.K. et al. (2015). Consumer sleep technologies: A review of the landscape. Journal of Clinical Sleep Medicine, 11(12), 1455. Leary, M.R. & Baumeister, R.F. (2000). The nature and function of self-esteem: Sociometer theory. In M. Zanna (Ed.) Advances in experimental social psychology (Vol. 32, pp.1–62). San Diego, CA: Academic Press. Leary, M.R., Tambor, E.S., Terdal, S.K. & Downs, D.L. (1995). Self-esteem as an interpersonal monitor: The sociometer hypothesis. Journal of Personality and Social Psychology, 68(3), 518–530. Marshall, T.C., Lefringhausen, K. & Ferenczi, N. (2015). The Big Five, self-esteem, and narcissism as predictors of the topics people write about in Facebook status updates. Personality and Individual Differences, 85, 35–40. Orth, U., Robins, R.W. & Widaman, K.F. (2012). Life-span development of self-esteem and its effects on important life outcomes. Journal of Personality and Social Psychology, 102(6), 1271–1288. Revonsuo, A. & Tarkko, K. (2002). Binding in dreams-the bizarreness of dream images and the unity of consciousness. Journal of Consciousness Studies, 9(7), 3–24. Rosen, M.G. & Sutton, J. (2013). Self-representation and perspectives in dreams. Philosophy Compass, 8(11), 1041–1053. Ross, M. (2002). It feels like yesterday: The social psychology of subjective time judgments. Paper presented at the Annual Meeting of the Society for Personality and Social Psychology, Savannah, GA.
Selterman, D.F., Apetroaia, A.I., Riela, S. & Aron, A.(2014). Dreaming of you: Behavior and emotion in dreams of significant others predict subsequent relational behavior. Social Psychological and Personality Science 5(1), 111–118. Smith, W.R. & Treem, J. (2017). Striving to be King of Mobile Mountains: Communication and organizing through digital fitness technology. Communication Studies, 68(2), 135–151. Stragier, J., Evens, T. & Mechant, P. (2015). Broadcast yourself: An exploratory study of sharing physical activity on social networking sites. Media International Australia, 155(1), 120–129. Vignoles, V.L., Regalia, C., Manzi, C. et al. (2006). Beyond self-esteem: Influence of multiple motives on identity construction. Journal of Personality and Social Psychology, 90(2), 308–333. West, L.R. (2015). Strava: Challenge yourself to greater heights in physical activity/cycling and running. British Journal of Sports Medicine, 49(15), 1024.